6 Pieces Nurnberger Pork Sausages (P180++) with Konig Pilsner 330ml (P99++)! “Oh Mickey, you’re so fine, You’re so fine, you blow my mind, Hey Mickey! Hey Mickey!” I can’t help but sing that song after checking out Mickey’s along Jupiter. No wonder they are full every night I passby Jupiter with mostly foreigners as their customers. This would be a great place to celebrate the La Salle victory over Ateneo 🙂 Perfect place for Octoberfest! 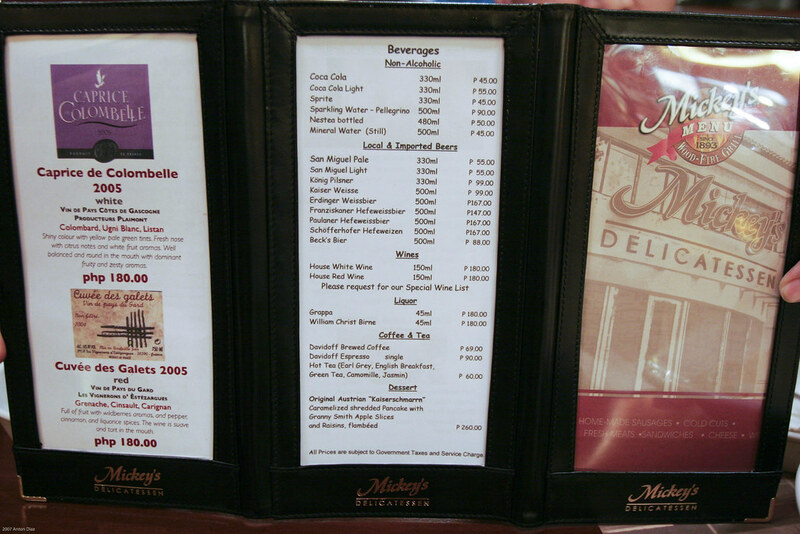 Mickey’s Main Menu and Drinks Menu. The secret to Mickey’s sausages is that they make it themselves and they cooked it in an open wood fire grill! You can taste the smokey flavor and all the juices of the meat trapped inside and eat it while its hot. As in any deli, there are a wide variety of cheeses, cold cuts, and wine. The Nurnberger Pork Sausages are the best seller and you can take it out. 6 Pieces Nurnberger Pork Sausages (P180++). Served with a choice of Sauerkraut or Warm Bavarian Potato Salad. It has the texture of a longganiza with a smokey sausage taste. Each sausage costs P30++ but it is worth it. Goes well with beer and the Potato salad was a pleasant companion to this meat. Spaghetti Bolognese (P270++). Literally we are dreaming about this Bolognese because of the distinctive impression it left on us. Aidan and Rache loved it and it is served with generous meat ingredients and wishing that there would also be more pasta. Mickey’s Italian Burger (P250++). Pure Pork Meat with a light garlic flavor topped with Lettuce, Tomatoes, crispy Bacon and Cheese served in original Ciabatta bread. Love, love the pork meat! Cooking takes a while but I’m sure the wait is worth it! Same with the pizza! We’ll order it next time. Lartizan Turnover — The bestseller in Lartizan is prepared right before your eyes. This reminds me of French Baker and now I know why. Highly recommend this place. despite the snobbish treatment of the owners. I guess it is OK to be a little bit of racist these days. Mike called me about this comment and they apologize because his wife thought that I was a spy from Santis. Oh Well… Thanks Mike for the nice feedback on this. He reassured me that the family is not racists and I also apologize for making that comment too. Peace! Mixology 101 by Happy Hours Inc.
arrgh… naunahan mo ako!!.. went here a few months ago to grab dessert.. kaso wala pa.. so we just bought bread at Lartizan…. The beer list is PATHETIC! You’d find a better list at Murphy’s and this totally pales in comparison to Beers Paradise. Both places have basic stuff like Chimay, Stella Artois and Victoria Bitter and a good number of the more popular beers from beer producing countries. Beers Paradise even has Hoegaarden on tap. Hoegaarden is probably the best Belgian beer I’ve tried – but then again I’m more partial to Belgian than German beers! So, why do you say the owners were snobbish? Although it may be true what Ave. Q says about everyone being a little bit racist, that doesn’t make it right. the owner was quite friendly when we ate there about three weeks ago. we’d like to go back and try the pizza (they ran out that night). service was a bit slow though because the place was fairly new. just had my lunch there. sausages are great. i like the smoky flavor and that it’s freshly made. the owner was friendly too. he was very helpful to the deli customers providing them with inputs on the products. he even opened a pack of i dunno what to let us try it because it’s addicting daw. however, i didn’t like it – it tasted like chorizo. the third picture reminds me of the movie ratatouille. i haven’t been to mickey’s but it sure looks it’s worth a try. i have tried crispy pork knuckles when i went to germany many, many years ago. it was soooo good. you should’ve ordered it at mickey’s. went again to mickey’s last night for a friend’s birthday treat. this time, i stayed and eat. last time, i just bought cold cuts and bread. it was a good experience and we even had a picture taken with michael beck. he was okay with us during the stay. what we didn’t like was the way the servers treated our bill. i ordered separately cold cuts for take home and i asked the server to separate my bill from our dine in bill, guess what! he charged all to my credit card. urgh! talk about paying for my own bag and for the whole group. good thing i was not in the mood to be a diva last night. at any rate, i still love the bread and their cold cuts. if you are already crazy about the Nurnberger sausages, they still have hundreds of variety of sausages and cold cuts here in Germany that food loving Pinoys should discover.The pork knuckles actually is similar to our dear Crispy Pata.I think beside the stuffed pork belly is a meatloaf called leberkaese-also highly recommended.don’t snub the sausage beside the Nurnberger which is called bratwurst, its also delicious (can also be mixed with veggies on stick).Among the beers, I could recommend Franciskaner and Paulaner-they are usually served in a special high glass, that when poured, the glass should be tilted a bit that the beer sliding down- and usually they include it with a slice of lemon.enjoy! We liked the stuffed pork belly. it’s krysta from cisco..hope you still remember. i just came across your site looking for a deli place to take one of my clients…i didn’t know you have a blog pala! thanks for the review of the resto! it’s really helpful for us looking for a place to hangout but not sure what it has to offer…very helpful indeed=) thanks and hope to see you soon! i tried this place last night. had the sausage and the angus burger. both were really good. the only thing i didnt like about this place is their service. it was really bad. Went to Mickey’s with a date last 30 November and the service was very good. The food attendants were cheerful and ready to serve. We love their pork belly – thick, soft, and very filling. Of course the Meat Platter was to die for. The wine was very good — by itself it seems unremarkable but it surprisingly complements the entire meal. Coffee was good, too. Mickey’s Italian burger, Pure Angus burger, Crispy pork knuckles, pasta, warm Bavarian salad, LARTIZAN bread and a list of imported beers (Erdinger, Stella Artois, Heineken, Becks, Warsteiner, Hoegarden, etc… They even have assorted cold cuts platter for parties. Hey Benette C, just wondering how you know what an abortion house looks like. Your comment is rude and uncalled for. If you don’t agree with Anton, then don’t read his blog and spare the rest of us who do appreciate his efforts. POOR SERVICE – our first order, a salad, took 20 mins to arrive. This is not an acceptable serving time for fresh salad. We also ordered beef stroganoff that took 30 mins which I could’ve forgiven, but not after I saw what it looked like. The beef, which was sliced thinly, can be cooked in a mere 5 mins. Lastly, the sausage arrived in 25 mins, just before the stroganoff. The reason: we asked the waiter to serve it with sauerkraut instead of the potato, the message somehow got lost in the kitchen, so they served us the latter. When we asked her to take it back, we saw they served it to another customer, and we had to wait for new sausages to be cooked. The sausages could’ve been easily picked off the dish and served to us with the sauerkraut so we wouldn’t have waited. Most noticeable: no apologies were given. 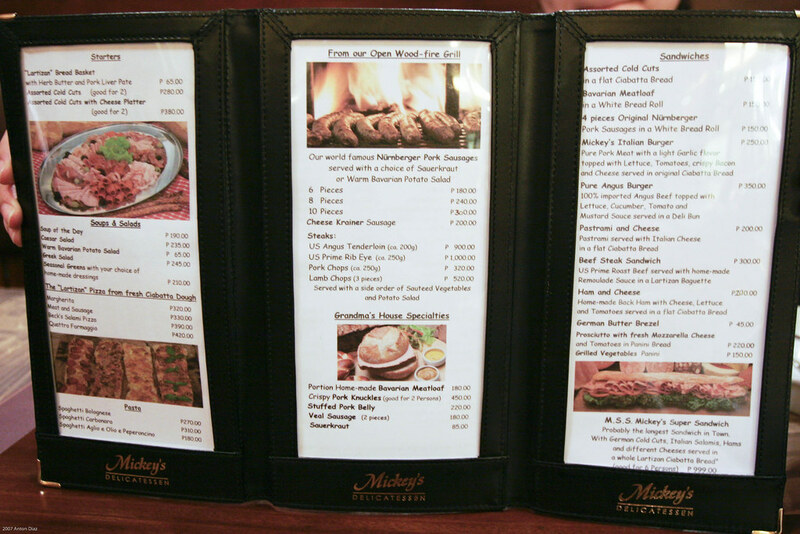 LITTLE VALUE FOR MONEY – except for the salad, the dishes we ordered are generally expensive for the quantity provided. The sausage links were small and didn’t really taste that great, I actually rated it a 5 (1-10 scale), and I being a sausage lover. The stroganoff was good but where’s the beef? For P600+, customers deserve to have more meat. We paid P2,000+ for these 3 orders, a beer, and a couple scoops of gelato, and I left the place still hungry. For this amount, you can go to an all-you-can-eat hotel buffet with unlimited prime rib to boot. Not worth it. Lastly, WE DID FEEL THE STAFF WERE DISCRIMINATING (not racist) – they were serving 4 tables, two were foreigner groups. My wife didn’t share this with me during that night because she didn’t want to spoil the dinner. But last night, she just asked if I felt the same, so we had to discuss our experience and exchanged opinions. For such an expensive place with mostly foreign patrons, service should be good. Waiters do not articulate well, almost seem embarrassed to take your order. No one’s watching the customers, you have to strain your arms and neck to get noticed, to think that they were only serving 4 tables and the place is not that big. They are not very familiar with the menu, they can’t describe the dishes. Lastly, my wife told me that one of the staff behind the counter made a rude face and dropped a tub of cheese and slammed close the chiller after we asked for prices of some items but declined to buy any during that time. We were dressed more casually compared to the others, I was in jeans/shirt/sneakers (it’s a DELI!). But it shouldn’t create a cold reaction from the staff. Having worked for a number of service companies, I always notice the service first, and this place is poor when it comes to that department. Won’t go back here again, nor will I recommend this place. I paid P320 for a sandwich I thought would, at the very least, feed 2 people for the price I paid… boy, was I wrong!!! 2 pathetic slices of a small white bread, 3 1/2 razor-thinly sliced meat, a couple of leaves of lettuce, and a dollop of sauce does not a FREAKIN’ P320 sandwich make.. Sadly mickeys restaurant is no more. Michael beck has been in a coma since 2009. I believe he just passed away. Sad story. This has been published in the papers before. BRING BACK SCHWARZWALDER, PLEASE!!! IF THERE’S ANYONE OUT THERE CONNECTED TO THE OWNERS OR STAFFS OF THIS GERMAN RESTAURANT, PLEASE RESPOND, PLEASE!! !